CPUs in each bar series are ordered by retail price in ascending order. 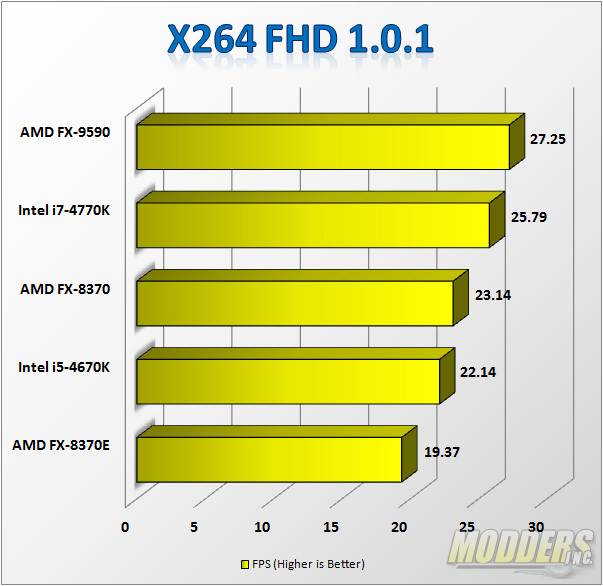 The FX-9590 is in yellow on the left of each series and Intel only has a CPU that beats the AMD offering in 4 out of 17 price-scaled benchmarks, most of which are synthetic and don’t represent any typical real-world workloads. Don’t buy Intel CPUs and boards until they stop selling “pin bending” LGA 1155/1156 sockets! My name is Carl and I am contacting you in regards to RMA [rma_number]. The RMA was placed on hold by our inspections department due to reported physical damage on the MB ASROCK|P67 PRO3 SE P67 LGA1155 R.
Normally when an item is received damaged or missing the retail box and/or accessories, it voids our return policy and the item becomes ineligible to be accepted by Newegg. When a motherboard, and other items, are returned back to Newegg, they are inspected under a magnifier and are supervised. We look to see if the board was ever installed and look for signs of end user damage, aside from testing the unit to check its functionality. Signs of installation include bent pins, missing CPU cover or thermal paste. Our records reflect that when the motherboard was received under RMA# [rma_number] at the Newegg warehouse, an inspection was conducted based on the notes entered in the RMA as to the reason for the return. At that time, the inspection revealed that the motherboard had sustained physical damage to the CPU socket wherein bent pins were detected. While the RMA does not fall within our return policy guidelines, Newegg has authorized an exception be made in this case and we agree to accept the item as is and process the RMA for a replacement. At this time, the RMA will be processed, as originally requested and as soon as possible. We want you to know we appreciate your relationship with us and if you have any questions or concerns, please feel free to email me directly Carl.S.Pittman@newegg.com and it will be my pleasure to assist you. Thank you and have an EGGcellent day! www.newegg.com – Once You Know, You Newegg! The LGA 1155 and 1156 sockets for the Core i3/i5/i7 and (Celeron/Pentium equivalents) represent a terrible and unnecessary engineering decision by Intel that effectively neuters any warranty you may have while risking that somewhere down the line a very minor mishap could easily destroy the socket on an expensive motherboard, rendering it worthless. Despite having written articles about how AMD beats Intel if performance-per-dollar ratios are considered, I have built many Intel-based systems for customers, often due to factors such as availability of parts and motherboard features such as onboard video (or simply at the request of the customer.) I don’t have a problem with Intel processors, and I haven’t exactly been unhappy with them in computers I have previously owned such as my (sold) Core i7-2630QM laptop. After having the LGA 11xx socket pin issue personally bite me in the backside, though, I am beyond bitter on Intel processors, and I would strongly encourage anyone who is building a new computer system or rebuilding an existing one with a new motherboard and CPU to boycott Intel processors and matching motherboards until they return to a sane pin-on-chip CPU design and dump the spring-loaded fragile pin-in-socket design they currently use. There is no valid excuse for this, Intel. You make excellent chips with crap socket physics, and in the end, your Haswell processors are garbage if the boards are so fragile that they break at every opportunity imaginable. SCENARIO: You use an Intel-based computing platform with an Intel SATA controller. You move an existing Windows installation or system image to a larger hard drive. After moving to the larger drive, you experience issues with services not starting, and/or Outlook or OneNote complains about Windows [Desktop] Search. You may experience problems with Windows Defender or Windows Update not functioning properly. SOLUTION: You are running an outdated version of the Intel Matrix Storage Manager and Intel Rapid Storage Technology driver and software, and it is interfering with the functionality of these services. Visit the Intel download center to download and install the latest Intel Rapid Storage Technology software for your operating system. Please leave a comment with feedback if this is helpful or not helpful! AMD beats Intel on price versus performance every single time. UPDATE: I wrote a newer “AMD beats Intel” article with much better information and more relevant processors. This was written April 1, 2012 and is not an April Fool’s joke. If you’re reading this years later for some reason, check to see if my reasoning still applies. I walked into a CompUSA store to purchase myself a new machine with lots of cores for faster compilation of the Tritech Service System, among other things I do daily that require Linux and for which I didn’t have a decent home machine to work with. Ever since I got Netflix, my Toshiba Satellite P775-S7215 (arguably the best laptop I’ve ever used in my life, and certainly more than I ever paid for a laptop before) has been stuck in Windows 7 so that I can watch things while I work. It’s also nice to have the Windows GUI running for Internet use and document reading while plunking around in Linux on the compiling machine, which I have given the name “Beast” because…well, it’s a beast…but I digress. I walked into a CompUSA store, started tossing items into the shopping cart, and got to the CPUs, for which someone must help me since they’re behind a counter. I asked what they had, and then said I was debating AMD vs. Intel. The employee behind the counter made the blanket statement, “Intel is always going to beat AMD.” I knew better, so I headed over to my favorite place to compare raw CPU performance, and started asking him for CPU prices and names. When PRICE was taken into account, AMD always beat Intel, rather than what he had told me, and he seemed as if he had lost a piece of his religion when I told him about it. 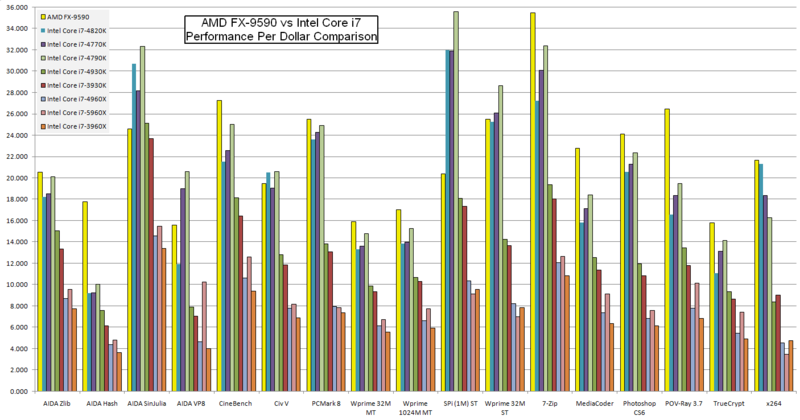 There’s a serious problem in the computer hobbyist world where blanket statements are made and repeated ad infinitum regarding a variety of things, and this AMD vs. Intel performance debate is the worst of them all. Before I explain why I say Intel loses to AMD on every price-to-performance ratio comparison, I’d like to mention another hardware experience that came before this which illustrates that skepticism and Google-Fu are extremely powerful tools. The WD20EARS 2TB 5900RPM SATA hard drives no longer have the excessive head unloading issue, which was a severe problem and very common cause of failure before even a single year of use was had in those particular Western Digital drives (and I believe some other early WD Green drives as well). I know this because I looked it up while staring at two of these drives I wanted, and reading that the issue was no longer present in the newer series of WD20EARS drives, and then purchasing them and using smarton montools in Linux to CHECK THE HEAD UNLOAD COUNT during a variety of usage scenarios. The count didn’t exceed 100 unloads within a week, and that put the issue to rest for me. (The approximate unload count needed for a drive to start failing is 300,000 and 100 in a week would take 3,000 weeks to reach that unload count.) I got two 2TB hard drives for $80 before the Thailand flooding happened, and I don’t have to worry about a manufacturer-caused premature failure occurring in them. On to the meat of this discussion. My methodology is extremely simple. Go to a website such as Newegg, pull up CPUs that are the same price (or very nearly so), and compare the CPUs at cpubenchmark.net. If you’d like to give them some sort of price-to-performance score so you can perform comparisons across prices, you can divide the CPU benchmark score by the price, then multiply by 100 (since you’ll get LOTS of decimal places). Let’s see how this works out in real-world terms. As of April 1, 2012, the price of an AMD Phenom II X6 1045T processor at Newegg is $149.99, while the best Core i3 available at Newegg (the Core i3-2130 dual-core) is also $149.99. There are two other Core i3 CPUs at that price, but they are slower or are a first-generation i3, and anyone who is a savvy buyer will get the best bang for the buck, so those are being ignored. Why not an i5 or i7? Well, it’s not an apples-to-apples comparison when you put a Phenom II X6 against an i5 or i7, not because of some notion of “CPU generation,” but because you can’t even get a Core i5 desktop CPU at Newegg for less than $179.99, so there’s simply no i5 or better in the Phenom II X6 price range; also keep in mind that I’m justifying a personal purchase which fits personal budgetary concerns (mine was a 1035T for $130), and I put the price difference toward getting 16GB of RAM instead. If you have a higher budget, you’d need to compare against a better AMD CPU, which we’ll do in a minute. So if we perform the price-to-performance score calculation that I came up with earlier, what do we come up with for these CPUs? We’ll also compare the cheapest available i5, which on a price-to-performance scale is also beaten by the selected Phenom II X6. 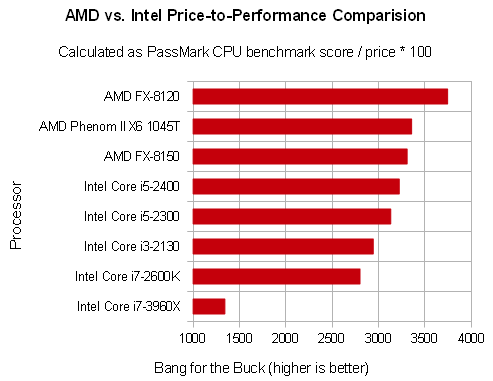 The AMD FX chip pummels the Core i5 at the same price point, and even my Phenom II X6 fails to be “worth it” compared to the FX-8120. If I was not on a budget, I would have gone for the FX-8120 instead. Note how even though the i5-2400 is the best Intel chip in this comparison so far, it still scores 133 points lower than the Phenom II X6. Higher numbers mean more value for the price. Let’s do a few more comparisons against CPUs that I might be interested in if I was building a high-performance box with a higher budget, such as the awesome i7-2600K, just to see where the numbers fall. I’ve gathered all of these numbers into a chart to summarize the point of this article. I think the chart speaks for itself. I also invite you to do your own math and draw your own conclusions. Feel free to leave a comment as well! Moving a Windows 7 image created on an AMD platform to an Intel platform, I ran into the dreaded Code 12 error with my Intel GMA3150 video device, indicating that it could not find enough free resources it can use. The culprit was the AMD PCI Express (3GIO) Filter Driver under the System Devices category in Device Manager. Right-click on the AMD PCI Express (3GIO) Filter Driver, uninstall the device, check the box to also REMOVE THE DRIVER FILES (otherwise it will return immediately) and reboot the computer. Install any missing device drivers normally, and reboot again, and you will no longer have the Code 12 error. If this helped you, would you please link back to this article? I’d appreciate it! Leave any questions in the comments section.